The research monograph Equal Citizenship and Its Limits in EU Law: We the Burden? is a critical study of the scope of EU citizenship as an 'equal status' of all Member State nationals. The book re-conceptualises the relationship between the status of EU citizenship and EU citizens' fundamental right to equal treatment by asking what indicates the presence of agency in EU law. A thorough analysis of the case-law is used to support the argument that the present view of active citizenship in EU law fails to explain how EU citizens should be treated in relation to one another and what counts as 'related' for the purposes of equal treatment in a transnational context. In addressing these questions, the book responds to the increasing need to find a more substantive theory of justice for the European Union. The book suggests that a more balanced view of agency in the case of EU citizens can be based on the inherent connection between citizens' agency and their subjectivity. This analysis provides an integrated philosophical account of transnational equality by showing that a new source of 'meaningful relationships' for the purposes of equal treatment arises from recognizing and treating EU citizens as full subjects of EU law and European integration. 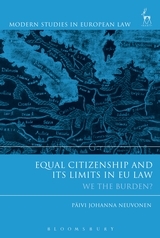 The book makes a significant contribution to the existing scholarship on EU law, first, by demonstrating that the undefined nature of EU citizenship is fundamentally a question about transnational justice and not just about individual rights and, secondly, by introducing a framework within which the current normative indeterminacy of EU citizenship can be overcome. Päivi Johanna Neuvonen is Academy of Finland Postdoctoral Researcher at the University of Helsinki.